J Hudson & Co was founded in the 1870s in Birmingham by Joseph Hudson (1848–1930) and his brother James Hudson (1850–1888) . The company became a manufacturer of whistles and is still active today as Acme Whistles. Acme is the world’s largest and most famous producer of whistles. Headquartered in the Jewellery Quarter district of Birmingham, England, their patented designs are the recognized standard in loud noise production. The company was family run for over 100 years and three generations; Joseph Hudson's son, James Clifford Hudson, and his grandson, Leon Clifford Hudson ran the company after Joseph retired. Today the company trades under the name Acme Whistles, and the company's manager and owner is Simon Topman. In 1883 Joseph Hudson, a toolmaker and violinist, began tinkering in his toolshed to make gadgets to sell. One of the things he made were whistles. After observing Bobbies (British Police) having a hard time communicating with rattles, he realized that his whistle could be used as a tool. As the story goes, Hudson accidentally dropped his violin and it shattered on the floor. After observing how the discordant sound of the strings breaking traveled, he got the idea to put a pea in the whistle. This gave it an ear splitting rattle that could grab attention up to two miles away. After a demonstration at Scotland Yard he had his first sale. Acme ThundererThe name “Acme” comes from the Greek word “acme”, meaning a high point. This indicates that the whistle is a tool for producing a very high decibel level. Their Tornado 2000 whistle demonstrates this as it is capable of easily reaching 122 decibels. First period divides to early period: up to Hudson winning the contract of supplying the Metropolitan Police with 7000 whistles at 1884 and prior to that. 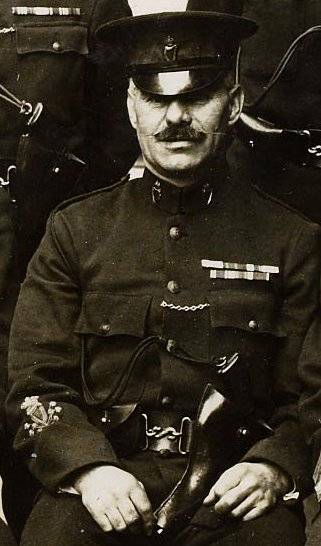 Early beginning: Joseph Hudson started working at the age of 12, at various jobs, later he began working for Bent & Parker a long established company of army supplies and whistle makers in Birmingham. at 1870 age 22 he started his own Business with younger brother James. 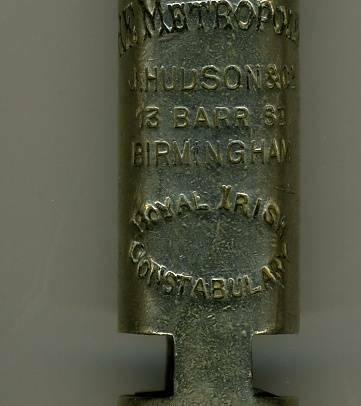 The 1884 contract gradually made Hudson the largest whistle manufacturer for British Empire Police and other general services. Close-up images of the whistle text showing readable addresses, Please click on each image to enlarge. Hudsons moved its company premises on five occassions between 1870 & 1909 - See table. This offers a reliable method of dating a particular whistle. In the 1890s, Hudson was faced with the rise of many competitor makers and companies . 1898 Hudson purchased Black & Co. and kept making their models. 1898 J Barrall ends his whistle making Business. 1901 Hudson is making Stevens & sons whistles. 1904 Hudson purchased R A Walton. 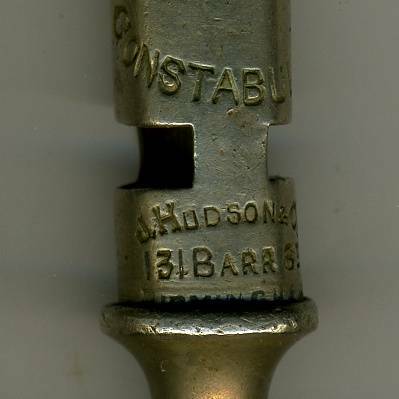 1907 Hudson purchased S Auld Whistle making business and kept manufacturing their models especially the Round " pignose " type known as 'Glasgow type police call'. 1904 Hudson is filling whistle orders (along with De Courcy) for [W Dowler & sons] who stops manufacturing whistles. During this period, Coney & Co. stopped making whistles and Hudson is making their models. In early 1900 Hudson is making whistles on a small scale for Bent & Parker. 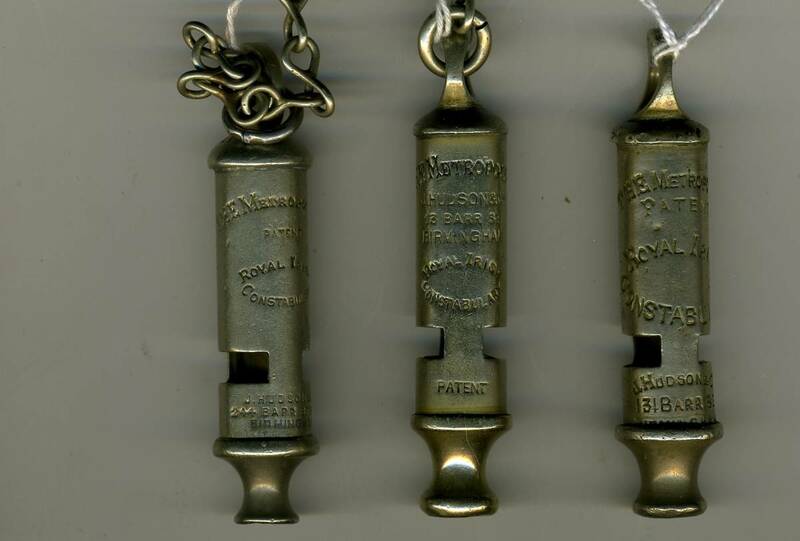 At an unknown date c, late 1890s early 1900 T Yates stops manufacturing whistles. Circa 1908 H A Ward stops making whistles. So in a period of 10 years. 1898 to 1908 all other whistle makers actually end making whistles, leaving Hudson and De Courcy as the two major whistle makers in England. Starting 1909 at a new Building in the northern part, 244 Barr St., Hudson changed their whistle making and expanded to more markets in Europe and overseas, with an office in Paris, a large 1910 French catalogue, and new connections with United States sporting goods companies and distributors. Hudson was left with just one British competitor, A De Courcy & Co, from 1909 to 1927. In 1927 Hudson purchased A De Courcy patent rights, tools and stock. 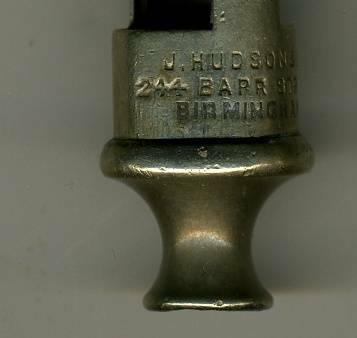 Hudson became the world's largest whistle maker, gaining the Thunderer Registered Trademark. The Acme thunderer whistle and its variations becomes the world's best selling whistle. During this transition time, 1925 to 1930, three generations of the Hudson family ran the business together. This was the end of the golden age of whistle making. The beginning of this period certainly stood in the shade of the Great Depression and the changing demand of the market using more and more plastic materials for making calls and whistles, trying to keep costs down and competing in a market that was flooded with cheaper tin and cast base metal whistles, made in Germany, Japan, U.S.A. & other countries. On October 26, 1940, the factory received a direct hit from a German air raid, no one was injured but the factory suffered a major crisis which took months to recover. The ARP whistles were made during the next few years and dated whistles for army, navy and Royal Air Force equipment and for Civil Defence. In 1949 the firm was re-constituted as J. Hudson & Co. (Whistles) Ltd. Leon C. Hudson became its first managing director. Note: All hudson whistles are cylindrical & not flat sided as scan seems to sugest. 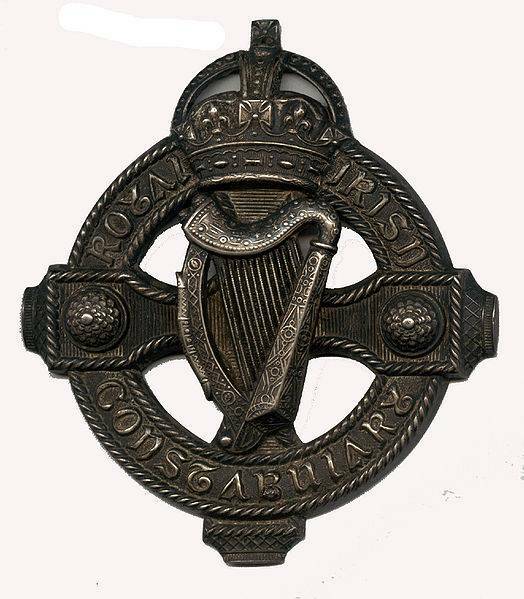 Hudsons also made 'Garda Siochana' inscribed whistles of this design & of course also 'Royal Ulster Constabulary' inscribed for the RUC in Northern Ireland.